The Chicco Bravo Stroller is the new, innovative tri-modal stroller platform. 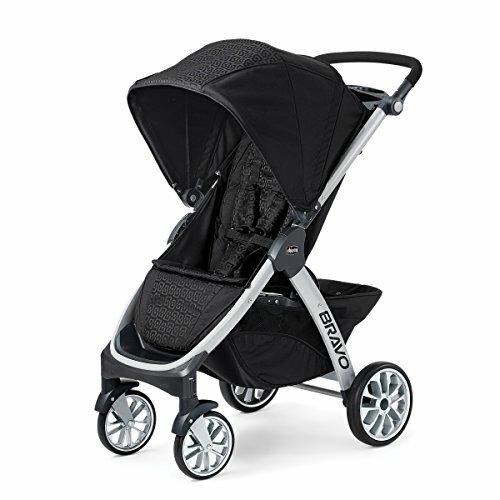 The Bravo Stroller is designed exclusively for use with the #1 rated Chicco Key Fit 30 Infant Car Seat. The Bravo provides three unique modes of use to adapt to your changing travel needs as baby grows. In its first mode for use with young infants, Bravo functions as a lightweight and stylish car seat carrier. The Bravo seat and canopy can be removed easily revealing a lightweight car seat carrier - most helpful when baby is always in the Key Fit. During the transition time when baby still rides in the Key Fit but may also like to sit up and see the world from the stroller, the Bravo functions as a travel system. When your baby outgrows the Key Fit, the Bravo is a full featured toddler stroller perfect for everyday travel for your growing baby. The aluminum frame Bravo stroller comes loaded with features to make strolling comfortable for baby and convenient for you. And only Chicco could improve on one-hand fold. Simply lift the handle under the seat and the front wheels swivel into position allowing a self-standing compact fold. The multi-position, reclining seat, and all-wheel suspension help to create just the right ride for baby. The large storage basket is accessible even when the backrest is fully reclined, and a height-adjustable handle easily accommodates both Mom and Dad. Other features include an extendable canopy with peek-a-boo window, linked rear brakes, and a 5-point harness. (Usage: from birth to 50 pound).